The number of iron and steel mills in Pittsburgh nearly quadrupled between 1850 and 1900, and the region’s mines were producing a fifth of all U.S. coal. In 1908, the journal Charities and the Commons sent a team to the city to study the situation, and Joseph Stella was hired as illustrator. This drawing was likely inspired by that trip. The Pittsburgh sky haunted Stella’s memory. 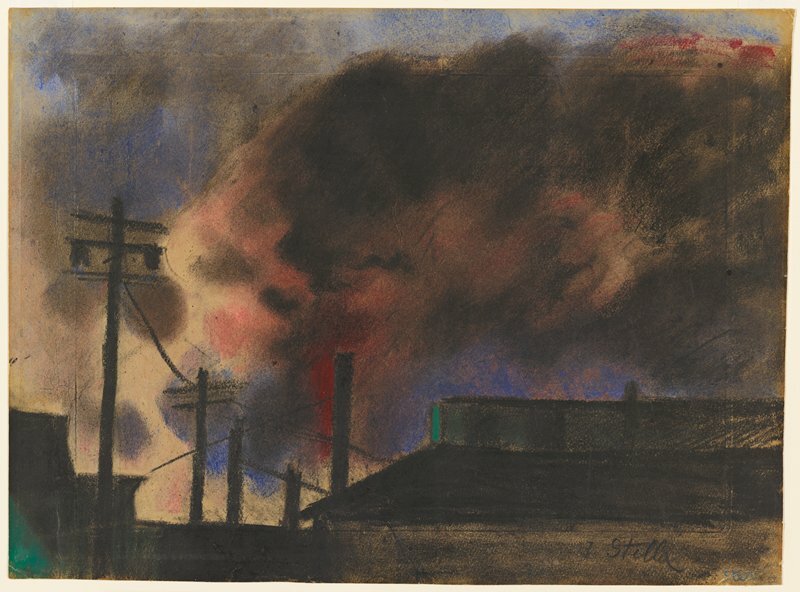 He wrote of “the black sky eternally black and throbbing with black smoke luridly sincopated [sic] here and there by bloody spots.” Just such a bloody spot spills from the smokestack nearest the factory in this drawing, while furnace emissions form circles of pink, gray, and brown in the sky. The dark mass seems to represent the dangerous labors of the workers inside the factory, but at the same time it signals prosperity for the city. [B. C. Holland Gallery, Chicago, until 1967, sold for $1,800 to 'Hawks]; Mrs. Stanley Hawks, Minneapolis ('1967-1975; sale, Benefit Art Auction, Minneapolis Institute of Arts, April 26, 1975, bought in; given to MIA).